Cancer is horrible, messy, and painful. If you are poor and get sick, no one in the medical community wants to help you. Don't even bother to ask. Dealing drugs is the only way to help a sick relative. Fat girls cannot have any friends. Fat girls cannot have romantic relationships. SUMMARY: Matt Nolan is the high school drug dealer, deadbeat, and soon-to-be dropout according to everyone at his school. His vice principal is counting down the days until Mr. 60% (aka Matt) finally flunks out and is no longer his problem. What no one knows is the only reason Matt sells drugs is to take care of his uncle Jack, who is dying of cancer. 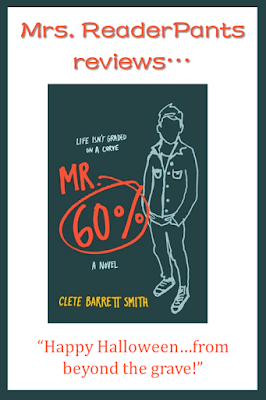 There are three main characters in Mr. 60%. We have Matt, high school drug dealer by day and sole caretaker of his sick uncle at night. Matt doesn't want to deal drugs, but he sees no other options. I went with the "poor drug dealer" persona for the sake of the story, but I still had a hard time with Matt's view that dealing is his only option. Jack does not sign up for medical assistance programs because he and Matt worry that social services will then discover that Matt is living with Jack. They worry that social services will force Jack to move back in with his grandmother, who would be the person receiving child welfare checks for Matt. But Matt is in the spring semester of his senior year; he's likely already 18 years old or very close to it. I doubt social services would worry about Matt, who is healthy, well-fed, and still in school, too much at this point. And speaking of Matt's grandma, she is likely receiving money from social services for Matt's foster care. There is no mention from Matt or Jack about getting that money that they are (legally!) entitled to. Better to deal drugs instead, right? And even if Matt is only seventeen, his living arrangements should not have any bearing on why Jack isn't receiving proper healthcare. No one is stopping them from still saying Matt lives with his grandmother. Jack is poor and extremely sick. He should be in a hospital or receiving home care, not self-medicating with morphine pills purchased from a shady local drug dealer. Yes, I know that cancer care is ridiculously expensive, but this man is dying and in a LOT of pain. He should at the very least qualify for some kind of financial assistance for medical care. Dealing drugs isn't Matt's only option. Our social safety nets are far from perfect, but they do exist. The second major character--and my favorite--is Matt's uncle, Jack. The portrayal of Jack's cancer is realistic and not at all glamorous. Jack is funny, feisty, and responsible. When no one else would step up and care for young Matt, Jack left his vagabond lifestyle and took Matt in. He could not legally become Matt's guardian because of previous brushes with the law, but it sounds like he did a great job with Matt anyway. The third major character is Amanda, a girl Matt ends up partnered with on a school community service project. Matt is to help Amanda deliver donated children's books to the hospital, but along the way, the two become close friends. There is no romance here, which I found kind of refreshing because you don't see that much in YA realistic fiction. But the non-romance also made me mad. If Amanda were not "fat," if she had been one of those "girls who don't know they're really gorgeous" we see so much in YA, would a romance have blossomed between Matt and Amanda? Amanda is a sweet girl who becomes a great friend to Matt at a difficult time. I find it hard to believe that neither of them ever had feelings for one another, and the only explanation I have for that is that Amanda is described (several times) as the dreaded FAT. Though Amanda is super-sweet, giving, and a loyal friend, she says (several times) that she doesn't have any friends. At all. Because she's so fat. I just don't buy it. Kind people have friends, and Amanda is a kind person. Obesity is a huge problem in America, and I guarantee every single person reading this review either is overweight or has at least one, if not several, overweight friends. If fat inherently equals no friends, then that's an awful lot of lonely, friendless people out there. So while I found the lack of romance refreshingly unique, I also think a romance between Amanda and Matt would have made this story stronger. Instead of telling overweight girls that they are doomed to friendless, boyfriend-less lives, why not give poor Amanda a couple of friends and a budding romance with the school's drug dealer? We could have seen a more interesting side of her otherwise-vanilla character. As it was, I just felt bad for her and wondered why no one--anywhere--wanted to be friends with this nice, normal girl. I know I've ranted a lot here, and I've probably made this story out to be something horrible and not at all recommended. I do think this book will appeal to high school boys who don't like to read. Boys who want something gritty and real. Boys who want to skip the romance and get behind a male character who feels like someone they might know. It's not a terrible book, but I wish the underlying messages were a little less bleak. THE BOTTOM LINE: A realistic, heartbreaking view of cancer with a couple of messages I did not like. I gave it three stars for its realism and potential appeal for reluctant male readers. STATUS IN MY LIBRARY: I do not plan to get this one. Curious about your opinion of Stars Beneath Our Feet. I liked the general story but felt that some groups and people were treatedly badly.